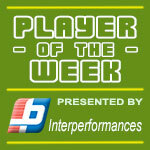 American Center Nick Waddell (200-C-89) had a great game in the last round for WELCOME, receiving a Interperformances Player of the Week award for round 19. The 29-year old player was the main contributor (32 points, eight rebounds and three assists) to his team's victory, helping them to beat Atenas (6-13) 100-91. The game rather meaningless between the teams, which do not have any influence on top of the standings. Welcome is placed at 11th position in Uruguayan LUB. Welcome is rather a weak team placed in lower part in the standings. They need more victories to improve their 6-13 record. In the team's last game Waddell had a remarkable 83.3% from 2-point range. He turned to be Welcome's top player in his first season with the team. Former Grand Valley State University star has very solid stats this year. Waddell is in league's top in points (8th best: 20.5ppg) and averages impressive 57.1% FGP and 56.3% from behind 3-point line. The second best player in last round's games was 30-year old American Duke Crews (203-F-88) of Sayago. Crews had a very good evening with 33 points and 9 rebounds. Bad luck as Sayago lost that game 83-100 to the higher-ranked Aguada (#8, 11-7). Sayago are still at the very bottom. 19 lost games are too many considering they did not win any game. Crews is a newcomer at Sayago, but is already one of team's top players. He belongs to the best scorers in the league with 19.2ppg (#9). His other stats are also decent: 10.4rpg and 3.6apg. 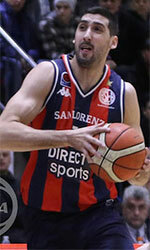 Third on the list of top players last round was forward Federico Haller (198-F-88) of Hebraica (#6). Haller got into 30-points club by scoring 32 points in the last round. He went also for nine rebounds . Despite Haller's great performance Hebraica lost 29-30 to the higher-ranked Malvin (#2, 13-4). But his team cannot count on just a single shooter as he also needs help of the other teammates. The last thing Hebraica needs is to lose another game like this one. They lose more and more distance to the top teams. Their record is 11 victories and 7 lost games. Haller has a very solid season. In 17 games in Uruguay he scored 17.6ppg. He also has 6.8rpg, FGP: 56.3% and 3PT: 43.4%.